AppyBuilder.com includes a component called FirebaseDB which provides a way to use cloud data in Android apps that you invent. The data is stored and maintained using Firebase database service (http://www.firebase.com), which is part of Google. A powerful feature of Firebase database is that data will be synchronized, in realtime, to every connected client. This means that if user1 stores a piece of data in the cloud, all connected clients will automatically be notified of the data change. 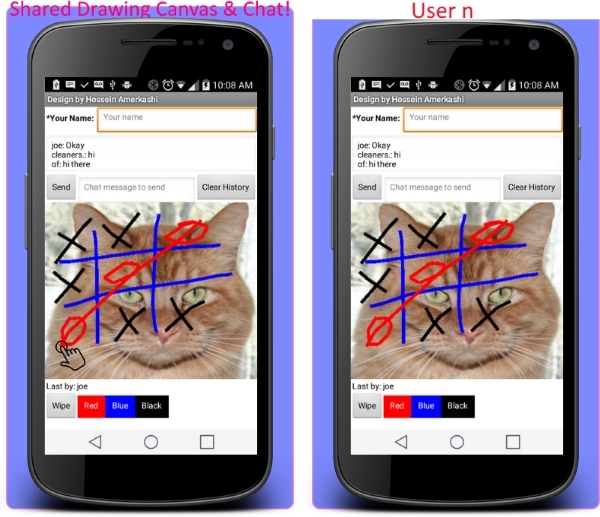 In this post, I’ll discuss how to develop a chat application, along with an interactive drawing app. The application will allow all connected users to chat with each. In addition, if any user draws on the app canvas, it will let all other user to view drawing, in realtime, as its being drawn! The final application will look like below showing two users chatting and playing the popular XOXO game. This app, will have the graphics layout shown above and will include realtime chat and interactive drawing capability where user’s will be able to chat and view each-other’s drawing in real-time! We’ll start by creating a new project and we’ll call it PaintPotVIII (for Part III). If you like to test the app, you can jump to bottom of this post and scan the QR code to install the app onto your device. Next, we need to add in a Label. 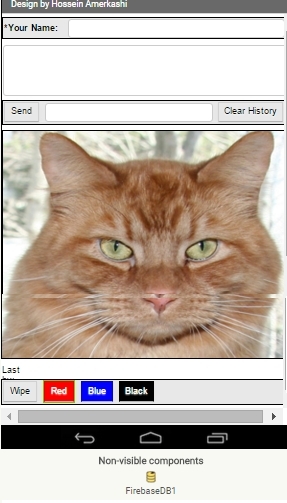 This label will be used to show the current user’s name, if any, who is drawing. The name will be populated from txtName of the client whom is drawing on the canvas. This will be covered in detail in the blocks editor. At this time, your layout, should look like image below. Think of FirebaseDB as datastorage with functionality like TinyWebDb, where you can store key, value pairs. For this, we declare and use five global variables as shown below. When drawing on canvas or when tapping any of our color buttons, we need to check if user has entered name. If so, we store user’s name in FirebaseDB in cloud. To avoid redundant coding, we define a Procedure and reuse this procedure from different event handler blocks. For this, we declare a Procedure named “validateNameAndStoreName”. It basically checks to see if user has entered a value in txtName textbox. If true, then we use use our KEY_USER variable to store user name into our FirebaseDB. If no name entered, then no action will be taken. Tapping on btnRed, btnBlue, btnBlack buttons should change the canvas pen color on our device AND also on ALL the connected devices. Blocks below shows that when button is clicked, we 1st, call our procedure validateNameAndStoreName procedure (see above). If you recall, that procedures checks to see if user has entered name and if so, it stores name into FirebaseDB. Next, based on clicked-button, we change the canvas paint color. Next, we store COLOR_RED (or black or blue) with a key of KEY_COMMAND into our database. 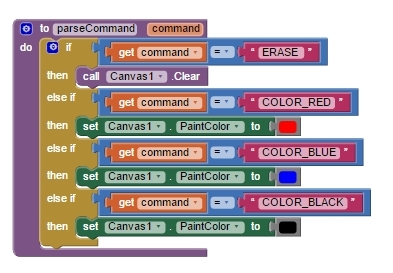 These blocks will change the canvas paint color on user’s device and I’ll later cover how we change the paint color on ALL other connected devices. Tapping on btnWipe should clear the canvas on our device and all other connected devices. Below are the blocks for this. The procedure checks to see if user has entered name, if so, it sends the user’s name to FirebaseDB. Next we clear the canvas. Then we store a value “ERASE” with key of KEY_COMMAND into FirebaseDB. We use KEY_COMMAND key as a generic tag (key) for storing color (above) or actions like ERASE (clearing canvas). More on this later. Next, I’ll cover how to draw on our canvas. When dragging finger on canvas, Canvas.Dragged event handler will be triggered. For this, we need to draw lines on our canvas, send our name to FirebaseDB and also store the x,y coordinates to FirebaseDB. For this, we call our validateNameAndStoreName to save name to database. Next, draw line on our canvas using Canvas.DrawLine. Next, we need to store prevX, PrevY, currentX, currentY to our database. We will store then in a CSV format as shown below using the join block and store into FirebaseDB using a key of KEY_LINE. Next, we’ll cover on sending chat messages. User can type a message in txtChatMsg textbox and tap the button to send the message. For this we perform a basic validation to ensure if any text has been entered or not. If no text entered, we don’t do anything. However, if text is entered, we send user’s name (using validateNameAndStoreName) to database. We also use our global variable KEY_CHAT to store chat message. Before sending the chat message, we take user’s name for txtName, join with colon (:) followed by chat message. Lastly, we clear the txtChatMsg. We are using a Procedure to accomplish this, but, for this, you could eliminate the procedure and pull all blocks into btnSendChat event handler. 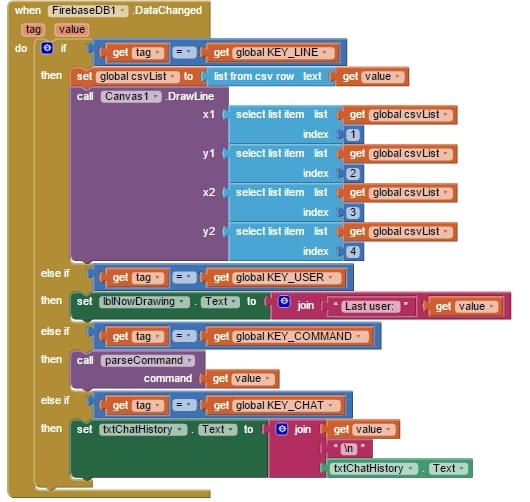 Up to this point, I have shown you how to draw lines or change color on your own device and also how to store data into cloud FirebaseDB. However, this is an interactive app and any drawing or chat messages, should be drawn on all other connected devices and messages should also be send to all other devices. FirebaseDB component has an event-handler block called DataChanged. Firebase sends notification to all other connected devices (for the same app) whenever its data is updated, deleted or inserted. For example, let’s say we execute FirebaseDB.StoreValue with key of KEY_USER and value of John. Once this value gets stored, FirebaseDB triggers DataChanged on every connected device that is running the same app. When this event is triggered, we check to see which piece of data has been changed. 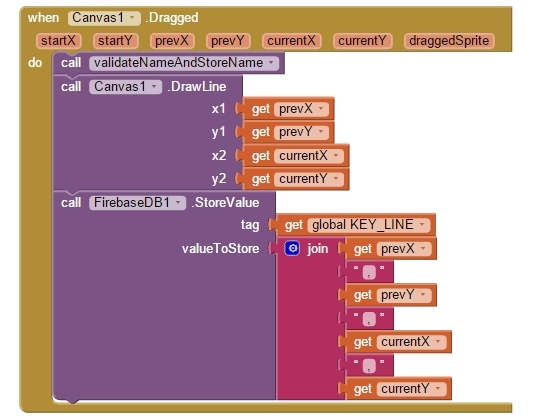 If you recall, when drawing on canvas, we stored prevX, prevY, currentX, currentY in CSV format with a key of KEY_LINE. The if block below, checks to see if the reported tag (key) is KEY_LINE. If yes, this means user another user is drawing on canvas. We get the CSV value, convert the CSV into a list using “list from csv row” and store it into our global csvList variable. Next, we simply take each piece of data and use it to draw lines on the canvas. If the tag (key) is KEY_USER, it means data has been updated in cloud. We get the associated value and update our lblNowDraing text to show its related value (last user’s name). 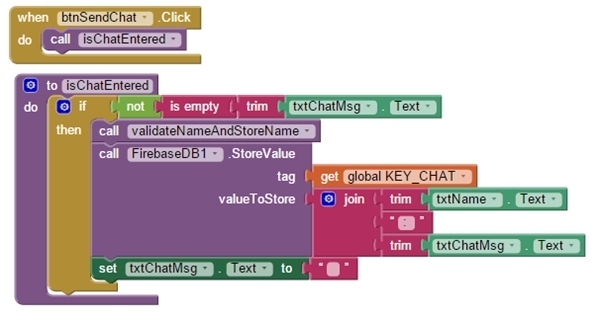 If the tag (key) is KEY_CHAT, it means someone has sent in chat message. For this, we basically take value and join it with an empty line (\n) and join it with existing txtChatHistory textory message. We then store the result back into txtChatHistory textbox. You can challenge yourself by extending this app’s feature to draw circles when canvas is touched. 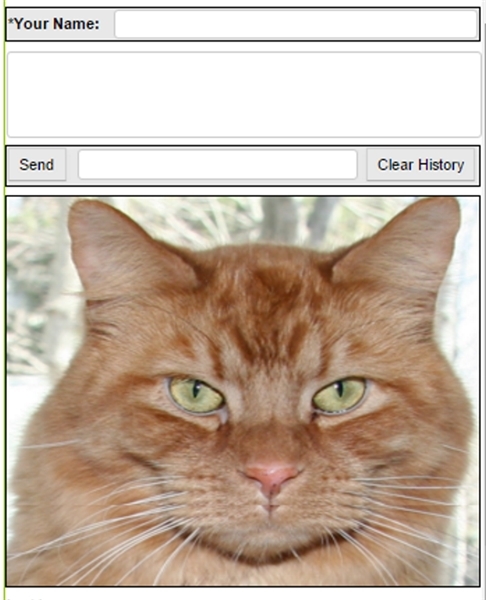 Another challenge would be to make the kitty meow when a button (e.g. Pet Me) is tapped. .apk – Click HERE to get the .apk to test on the app on your device. If you like to checkout AppyBuilder, please see our membership plans HERE. How can I erase from both screens without changing the pen color? Thank you . It would be great..if you pay for it via Google Play. I would immediately buy for a year. So I can use Appbuilder in full extent. A great tutorial, and wonderful feature. Thanks very much. At the moment, this sends the commands to all users of the app. How can I target specific users? So, if I have a game app (e.g. tic-tac-toe). I have multiple users of my app, but only two users are playing one game (with several users playing their own games at once). How do I ensure that, when user1 makes a change, it appears only on user2’s device, and not on user3’s, user4’s etc.? OK, I figured it out – As the game starts, just create a tag based on the usernames of the two players, and store the data under that tag. Then, when data changed, check the tag name – if the tag name is your game, then load the data. I cannot download the .aia file. Link was broken. Now fixed. Please refresh. Hi Mr. Hossein, excellent work as always! I was wondering in which db the data is stored in Firebase, I mean if we deploy this app, then the event .DataChanged is triggered only for users of our app (meaning that in some way automatically Firebase links the key, values to different database based on app id …) or it’s triggered for any change done in the shared Firebase Db? I am not sure it’s very clear from AI documentation which of the two case is true. By default, it uses the shared default Firebase account. You can change this behaviour though using the FirebaseDB designer properties. Just create a FirebaseDB account for yourself and change the designer property to point to your own account. So in this example it will get a .DataChanged also if other users of other apps make changes to the DB, I believe it’s better you specify this in your tutorial, just to be clear. I think basic usage of FireBase is free, so I would recommend to create a custom DB for every app you have and you want to publish. Thanks again for this interesting tutorial!